The Penguins of Madagascar have returned and this time they're the stars of their very own game! 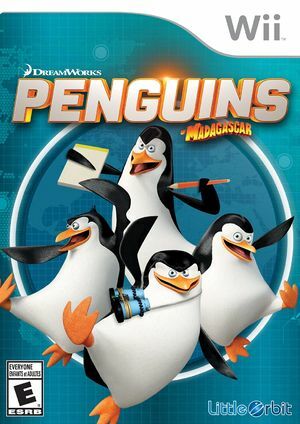 Based on the upcoming film The Penguins of Madagascar, the game follows the adventures of Skipper, Kowalski, Rico and Private in the pursuit for their beloved Cheezy Dibbles. Along the way they stumble upon a nefarious plot by the evil octopus, Dave (Dr. Octavius Brine). The penguins travel from their Tiki Home Base to such locales as Fort Knox, JFK Airport, and Monte Carlo in an attempt to foil Dave's evil plans. Penguins of Madagascar is a stealth platform-er where players take on the role of any of the four penguin heroes and instantly swap between them depending on the situation encountered. For example, Rico, a demolitions expert, can blow up specific walls while Skipper, a martial arts expert, can perform a Stun Slap that temporarily pauses enemy Octopi. The penguins also make use of various environmental objects such as trampolines, moving platforms and conveyor belts to further progress in their mission. As the penguins progress more will be revealed about Dave's sinister intentions and many Cheezy Dibbles will be gathered along the way. Screen flicker throughout introduction, all else fine. Likely resolved with Hybrid XFB. The graph below charts the compatibility with Penguins of Madagascar since Dolphin's 2.0 release, listing revisions only where a compatibility change occurred. This page was last edited on 16 January 2018, at 12:29.